Althea Ducati men Davide Giugliano and Carlos Checa secured first and second place in the opening qualifying session for the Russian round of the World Superbike Championship at Moscow Raceway today. Giugliano set an impressive 1m35.074s best around the 2.44 mile circuit comfortable outpacing his team-mate, Checa along with the rest of the field. Silverstone race two winner Sylvan Guintoli was another Ducati man at the front. The Frenchman set the third fastest time and with PATA Ducati team-mate Lorenzo Zanetti in seventh it highlighted Ducati’s impressive pace at the new circuit. Despite the track featuring one of the longest back straights on the calendar, which favours the faster four cylinders , the sweet handling 1200cc V-twin Ducati’s have a significant advantage in the tight and twisty first sector of the track which has led to their day one advantage. The first four cylinder rider was Marco Melandri onboard his BMW Motorrad S1000RR. 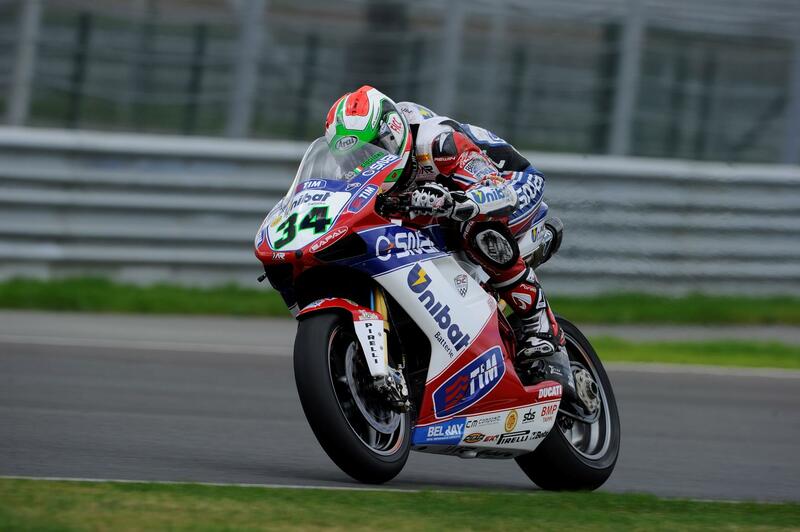 The inform Italian posted the fourth fastest lap time to end the session over 0.7s behind provisional pole man Giugliano. Chaz Davies backed up his first Free Practice time from this morning where he was second fastest to take fifth in qualifying and end the day as top Aprilia rider on his ParkinGO RSV4 machine. Fast qualifier and Superpole supremo Tom Sykes claimed the sixth fastest time with fellow Brits Leon Haslam in ninth and Jonathan Rea in tenth. Eugene Laverty had a tough first day on his factory Aprilia ending up 17th with Leon Camier in 18th after losing valuable track time when he had nowhere to go when Loris Baz crashed at the start of the session and both riders went down. It was also a slow start for championship leader Max Biaggi who finished the opening day down in 13th place – 1.2s off provisional pole.